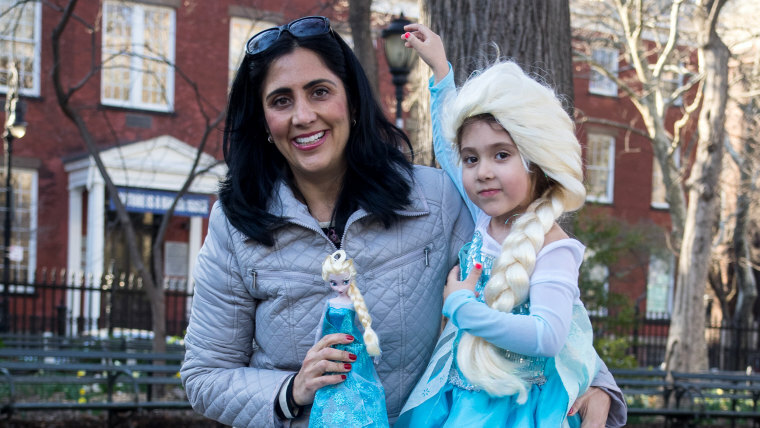 It was 3 a.m. when Lyla Gleason finally got her hands on an official Princess Elsa dress for her 4-year-old daughter. After weeks of hunting for the elusive blue costume from "Frozen," with countless visits to the Disney store in New York and fruitless searches online, Gleason felt like it was mission impossible to buy one of the hottest children’s items on the market right now. The blockbuster set records as the top-grossing animated film in box office history, and has mesmerized young audiences worldwide. But the supply of merchandise has not kept up with the demand, and some savvy sellers are asking north of $1,000 for glittery blue Elsa dresses. “I didn’t realize this movie was going to be such as obsession. We saw this film and then out of nowhere, she wanted all this stuff and it was unavailable,” Gleason told TODAY Moms. Acting on a tip that Disney would restock “Frozen” merchandise on its website to coincide with the DVD release last month, the New York mom put the date on her calendar and found herself at her computer in the middle of the night. The strategy paid off: For about $50, the Elsa dress was finally hers. Parents are on a desperate quest to see the same reaction on their children’s faces as the frenzy over official “Frozen” merchandise reaches red hot levels. Dolls and costumes are the hardest to find right now, with some of the dresses going for as much as $1,500 on eBay, said Christopher Byrne, an industry analyst known as “The Toy Guy” and content director of TimetoPlayMag.com. Check the websites of major retailers and you’ll find items like the Elsa dress are simply out of stock. “You just can’t get it. It’s really sold out and it’s probably the hottest thing out there right now,” Byrne said. DVD releases usually provide a bump in interest, but in this case, the DVD has spurred a huge demand for merchandise, Byrne added. Sara Hughart has been checking Disney.com every day for weeks. The Rockford, Ill., mom even explored the company’s European websites in her quest to find an Elsa dress for her 7-year-old daughter. Disney France had one available, but they won’t ship to the U.S., she discovered. “I don’t know why Disney didn’t anticipate this, but they were so unprepared,” Hughart said, bristling at the notion that the dresses are available for hundreds of dollars on eBay. Hughart has found a replica on Etsy for $30 that she plans to buy for her daughter. Like many parents, Hughart explored the DIY option, but thought the gossamer and organza dress would be hard to create. Gleason also thought about making the garment herself, but heard that the glittery blue fabric was sold out everywhere. Many women are venting their frustrations online. “I am ready to admit defeat. The dress itself, no problem, but that (expletive) cape. I almost resorted to seeing if the wedding tablecloth place would sell me one of their fancy overlays. This is all just nutty,” a commenter wrote on MommyShorts.com. Byrne believes many parents tie their self-worth into whether they can get this costume, or any hot toy, for their kids. They may see some relief soon -- no toy maker wants to leave money on the table so every effort will be made to ramp up production, Byrne said. For Gleason, it’s all about making her daughter happy.